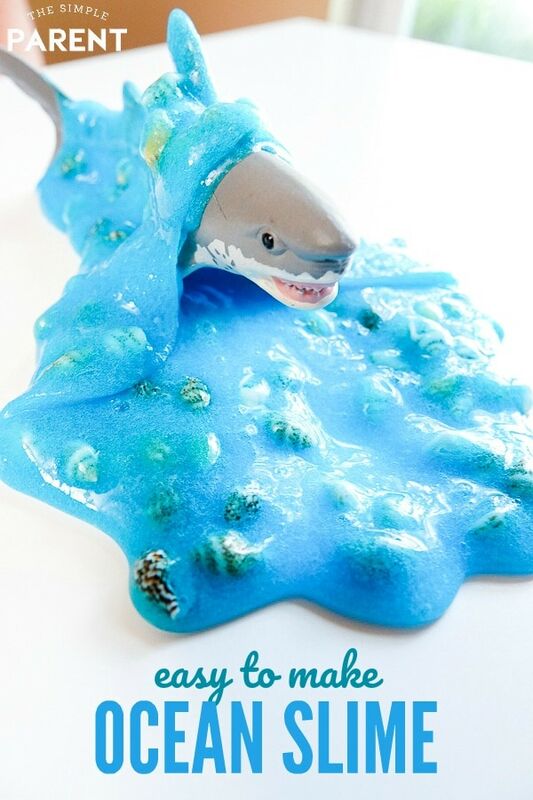 Home » Crafts & DIY » Celebrate Shark Week with Ocean Slime! Shark Week is here and that means we’ll be tuning in to learn more about one of the oceans most notorious inhabitants! This year is the 30th anniversary of Shark Week and we’re partnering with Crest to celebrate with our easy Ocean Slime! Crest is sponsoring this year’s Shark Week! Be sure to check out the fun video and get a $2 off coupon for Crest Pro-Health Toothpaste in honor of Shark Week. We all need pearly whites like those sharks, right? 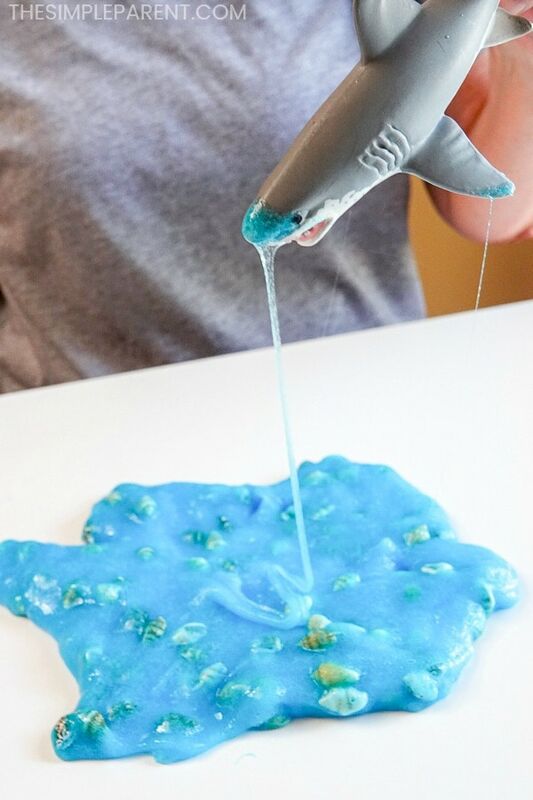 If you’re looking for a fun way to celebrate Shark Week with your kids, my kids give two thumbs up to this ocean slime recipe. 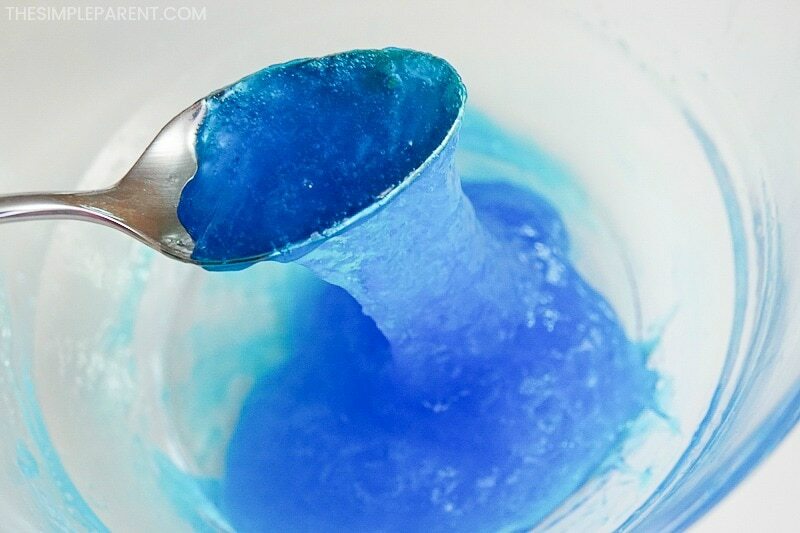 It’s easy to make by whipping up a batch of blue clear slime with a few extra special touches. We make ocean slime with our basic clear slime recipe. We prefer to make clear slime without borax. My favorite way to make blue slime is with liquid starch. I feel like liquid starch slime is one of the most fool-proof ways to make slime. It’s nearly impossible to mess up! As with any of our slime recipes, it’s important to remember that slime is a science project. Even liquid starch is a chemical. So kids should be old enough to participate and be well supervised. Be sure to wash everyone’s hands thoroughly when you’re done playing and clean all dishes and surfaces used. 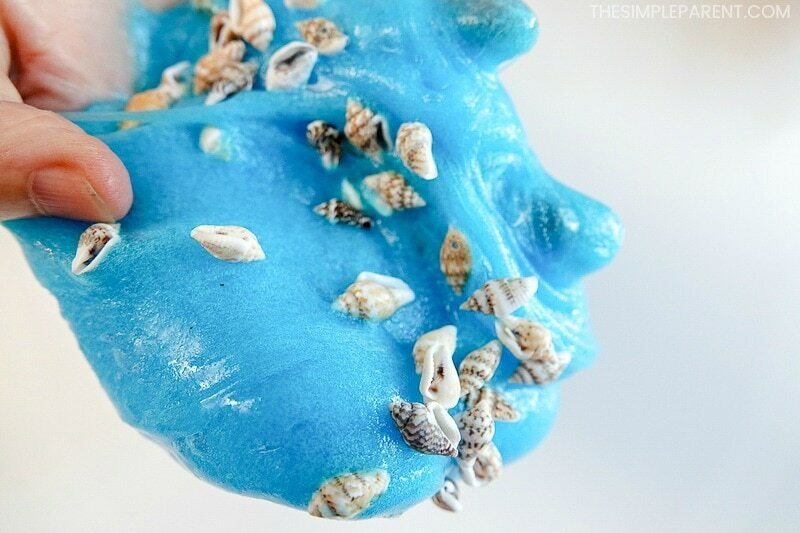 To make ocean or “sea slime” as my kids like to call it, you just have to know how to make blue slime with glue. Then you can decide what special items you might want to add to your slime recipe to make it your own ocean slime! 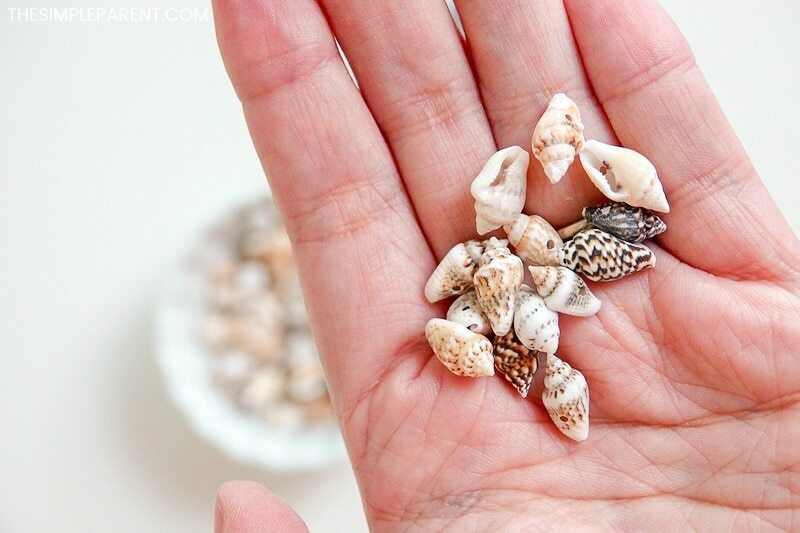 For our ocean slime recipe, we had fun adding in some small sea shell beads that we found at the craft store. You can play with it on its own or add fun things like shells and shark toys to it! 1. 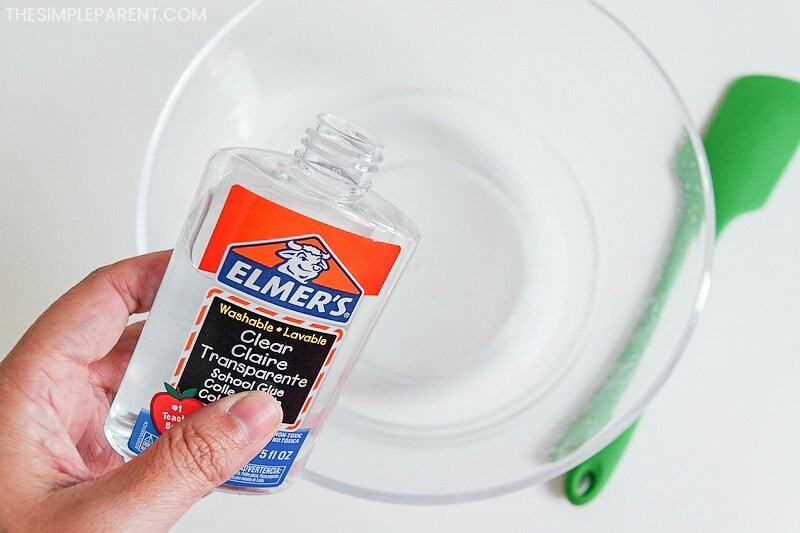 Pour your desired amount of clear glue in a large bowl. We usually start with one cup of clear glue when I’m making a batch of clear glue slime for the kids. 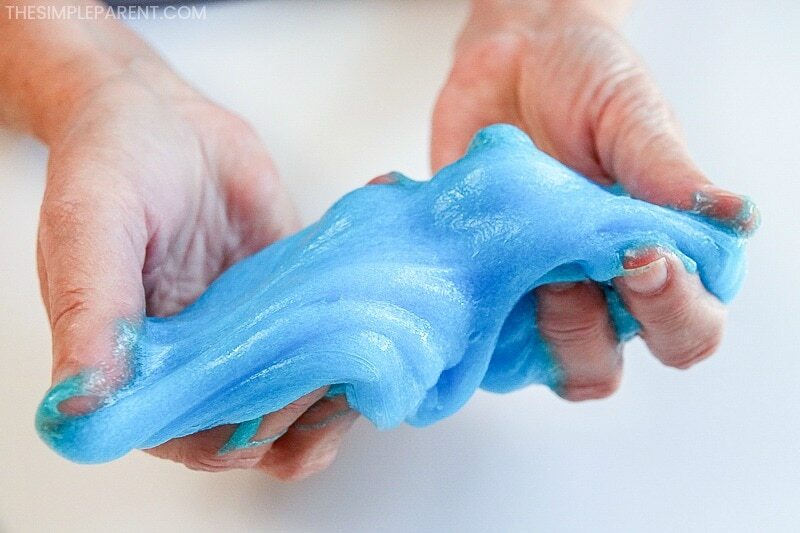 In this slime recipe, the amount of glue you use will be about the amount of slime you have to play with when you’re finished. If you have a larger number of kids celebrating Shark Week with you, then use more glue! If you’re just making ocean slime for one child, you might start with half a cup of slime. The great thing about making clear slime without borax is that you can easily tweak how much you make. 2. 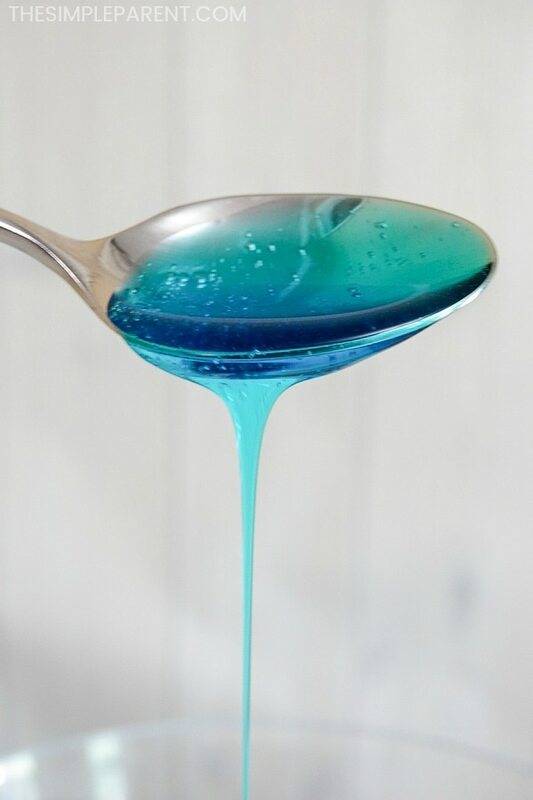 Add a drop of blue food coloring and stir into the glue. Gel food coloring is one of our favorite slime ingredients because you get a very bold color. You can use regular food coloring too. I always start with a single drop and then add more if needed to get the color blue we want. It’s easier to add more food coloring but you can’t really take it out without adding more glue. 3. Pour liquid starch into the glue mixture and start to mix with a spoon or spatula. This is the step where things can go wrong when you’re making liquid starch slime. Start slowly with the liquid starch. If you add too much, your slime will get hard. The slime will start to form fairly quickly and once it does, you can take it out of the bowl. 4. Knead with your hands until you get the desired consistency. If your slime is still sticky, you need more liquid starch. I add more using about a teaspoon at a time. You can either set the slime back in the bowl if there is still some starch in your bowl or add a bit more and continue pulling, pushing and kneading the slime. You may need more than 1/2 cup and that’s okay! 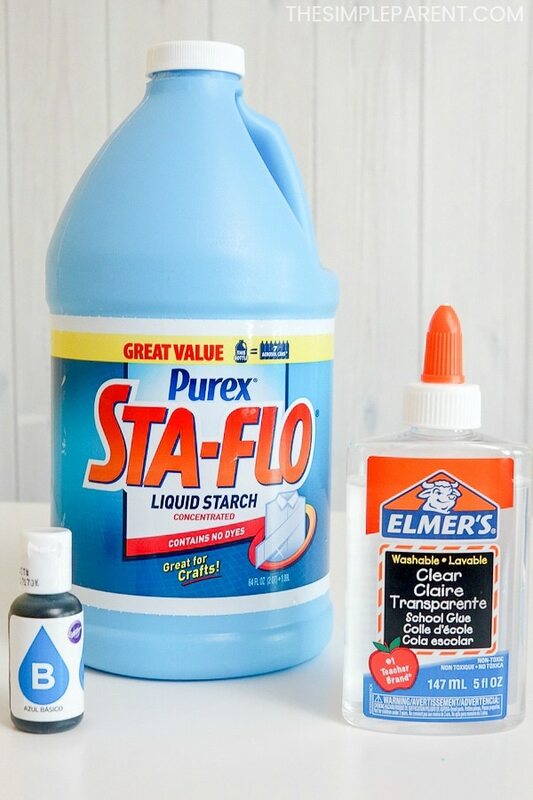 When you’re using clear glue you often need more starch than when you’re using white glue. Don’t quit working your slime too early. Keep working your slime and you will get the consistency you’re looking for! 5. 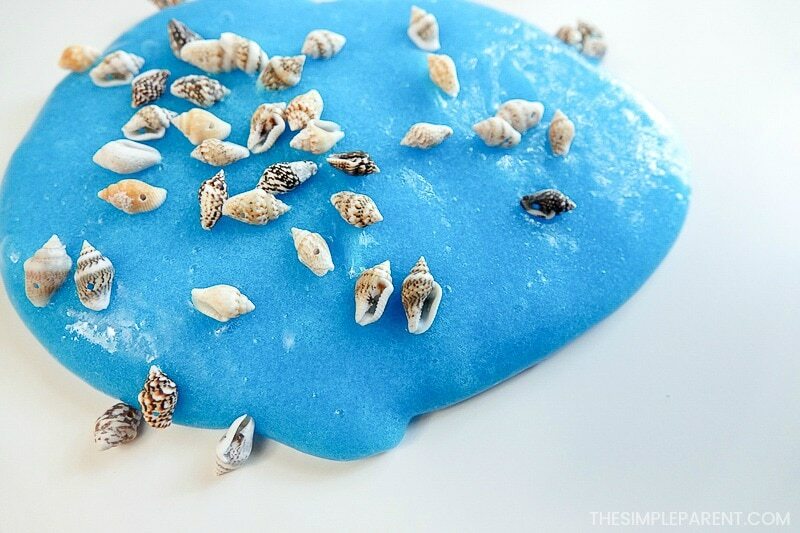 Lay slime out and sprinkle with shells. As your kids play with the slime, the shells will become part of the slime. I also find that playing with slime is calming when I’m feeling stressed out. Earlier this year I partnered with Crest to share more of my favorite stress management activities. 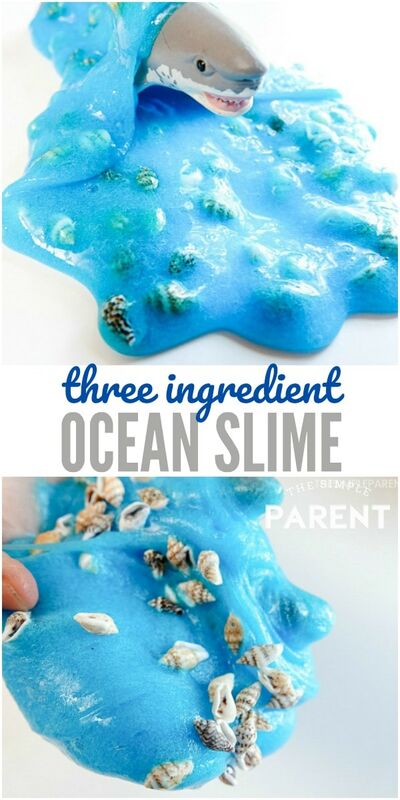 When you’re looking to chill out a bit and have some fun with your kids, ocean slime works well! 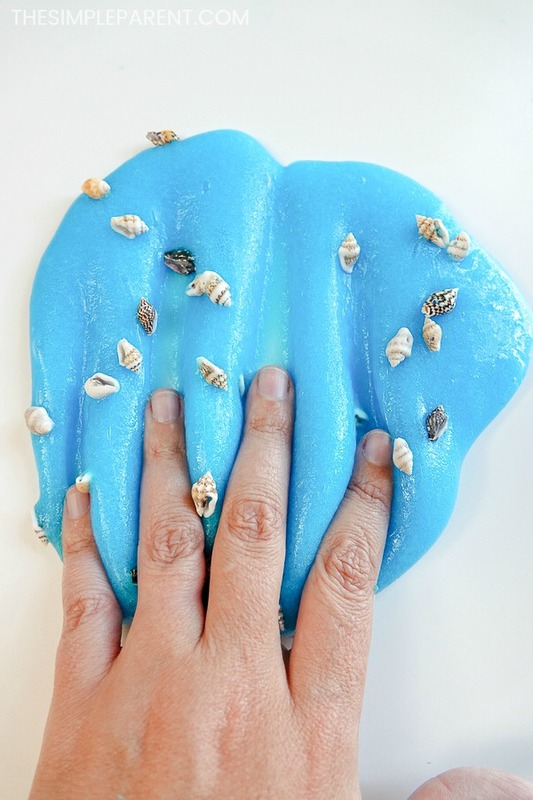 Ocean slime is the perfect activity to do while you enjoy Shark Week with your family! We love that the Discovery Channel Shark Week gives us the chance to enjoy some shows together and learn new things too! It’s definitely a must-see summer event for our family and for so many of our friends! I also love that Crest is a sponsor for this year’s Shark Week event! Check out this fun video while you get ready to tune in to Shark Week! 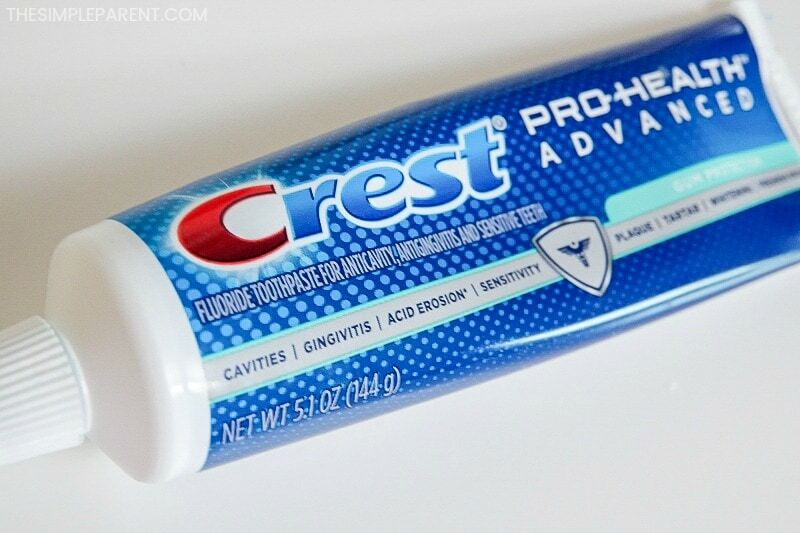 We’re huge fans of Crest products, especially the Crest Pro-Health line. It also helps whiten teeth and freshen breath while fighting plaque and gingivitis. 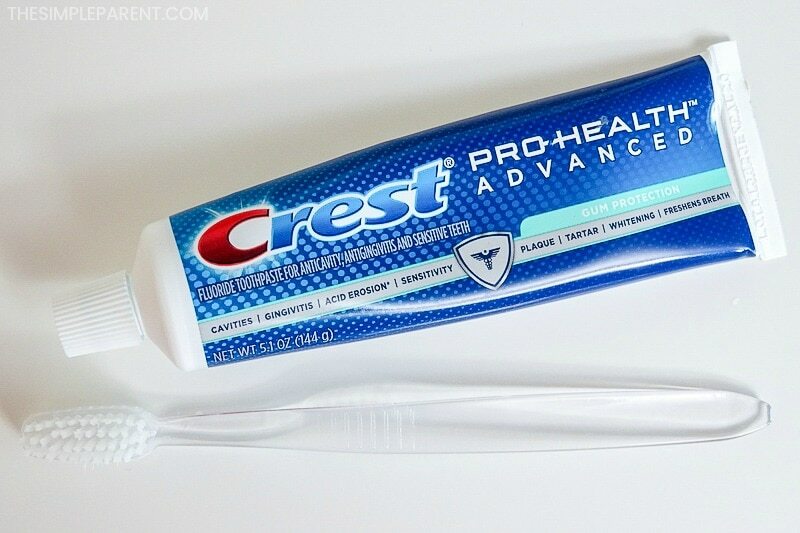 You can also get a coupon for $2 off Crest Pro-Health by signing up for P&G Everyday or login to access the digital coupon! So get your coupon and get ready to enjoy Shark Week with your family! We’ll be hooked to the Discovery Channel all week long and I’m pretty sure my kids will be beginning to play with ocean slime every day too!